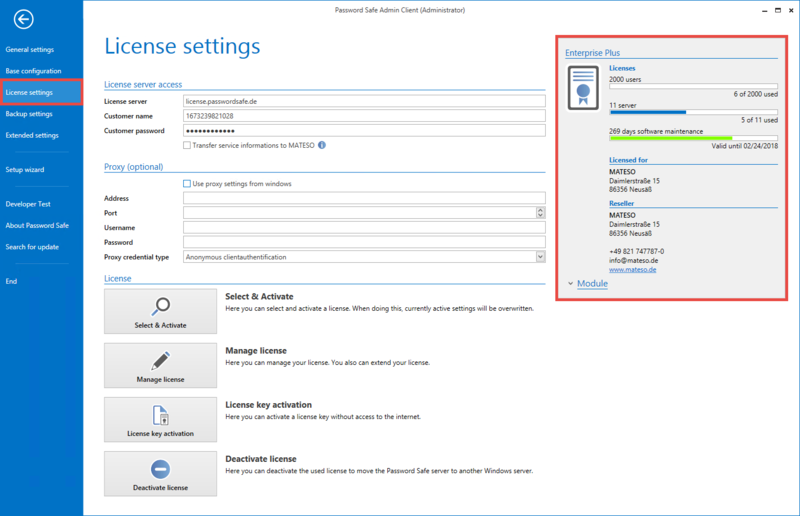 Licenses for the Password Safe are managed within the license settings. In addition, all current license details are displayed in the window provided for this purpose. !Version 7 licenses cannot be used for Password Safe Version 8. “Please contact us”: http: //www.passwordsafe.de to obtain a version 8 license. Ensure that this server is accessible. You may also use Proxy servers. The license is retrieved from the server and stored in the server configuration. The license will be checked every hour, and updated as required. The retention time is 30 days. If there is no internet connection, you can continue to work for 30 days. If this period should cause problems, please contact us. After purchase, you will receive the required license information in the form of “customer name” and “password”. Enter this information directly into the License Server Access area. Use the Select and Activate button to establish a connection to the license server. You can select the acquired licenses from a list. The license can be now used. *Optionally, you may specify a proxy. By default, the proxy stored in the operating system is used. !The licence is called up in the context of the service user. If you experience connection problems, the firewall and, if relevant, the proxy should be checked.